Inspired by Leonardo . . .
Hopwood-based artist Paula Hamilton seeks out local arts and crafts. Leonardo has come to Birmingham! Leonardo da Vinci is famous for his paintings, sculpture, architecture and inventions. He has influenced generations of artists and designers and is revered as a genius. But beyond a handful of paintings, most of Leonardo’s great projects were never completed. His surviving drawings are therefore our main source of knowledge of his achievements. 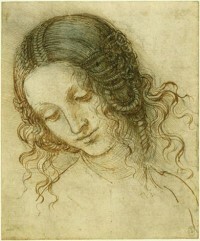 So if you didn’t get down to the big Leonardo exhibition in London, a sell-out show, you may well want to pick up the crumbs, as it were, and visit this small exhibition of 10 drawings at Birmingham Museum and Art Gallery, part of the Diamond Jubilee Celebration. If you do visit, you will find you are in good company. When we arrived one January morning, there was a queue of 20 people waiting to see the works. And there is a very good reason for this queue – the drawings are tiny and the light is relatively dim as a preservation measure so the viewer has to get right up close and press their nose against the work in order to see much. I’m going to be very honest and reveal what a philistine I am and say that, although I’m glad I went, I was a bit disappointed by what was on show. Why did Leonardo work on such a small scale? Was it to show his public how clever he was? Was it done as a clever trick? If you enjoying making art as well as looking at it, hopefully the following will be of interest. I’ve recently discovered and visited Avoncroft Arts Centre in Bromsgrove. It’s a really interesting centre for arts and crafts and formed from part of a house that used to belong to the philanthropist and “Salt King”, John Corbett. John Corbett made his fortune from Stoke Prior salt in the second half of the 19th century and was a man who didn’t simply use this fortune for his own ends but also reinvested profits into business processes, innovation and also into improving his workforce’s working conditions. He even raised wages for his workers, who were so well paid for the time that many could boast that their wives didn’t need to work at all. As well as developing Droitwich and building houses for his workers, in the way that the Cadbury family created Bournville Village, John Corbett built Chateau Impney for his French-born wife. Avoncroft Arts Centre was originally the stable block belonging to what was John Corbett’s house, before he built and moved to Chateau Impney. 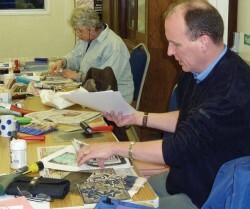 Rachel Stowe runs day-time and evening printmaking classes at Avoncroft. When I visited her in the studio where she teaches, her pupils were producing some impressive lino prints and wood cuts. There are inks, cutting tools and a printing press as well as lots of space to work in, plus the expertise of Rachel who is a trained textile designer and print maker. Rachel also takes her students through other print making techniques such as mono print, stencil print and collagraph. She herself produces beautiful scarves and other textiles using the devore method of screen printing. It is unlikely that any of us are going to become the next Leonardo but those of us who like to channel our creativity have much to inspire us close at hand.